Center for the Study of Contemporary China podcast explores Chinese politics, economics, law, and society. 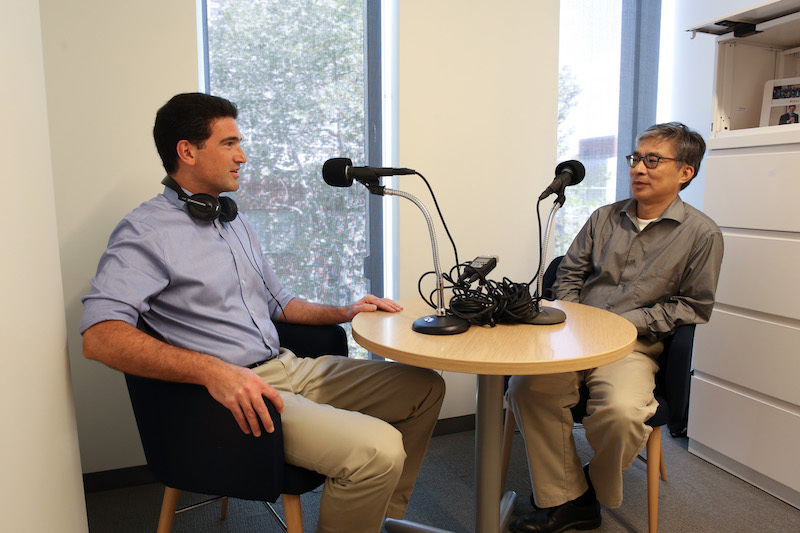 Research scholar Neysun Mahboubi (left) hosts a podcast produced by Penn's Center for the Study of Contemporary China (CSCC). Here he interviews Guobin Yang, Grace Lee Boggs Professor of Communication and Sociology, for a recent episode on internet culture and politics in China. These days, podcasts are so ubiquitous that the term hardly requires a definition. The digital audio shows, which listeners stream live or download to consume at their convenience, keep people entertained and informed whether they’re navigating their commute, working out, walking the dog, or doing laundry. Although podcasting has cemented its place in pop culture, academia has been slower to embrace the medium. Neysun Mahboubi, a research scholar in Penn’s Center for the Study of Contemporary China (CSCC), thinks more educators should be using podcasts to broaden their reach—like he is doing with the series he began producing for the CSCC last year. Mahboubi set out to record discussions with Penn professors and visiting scholars, then enhanced them with music and careful sound editing. His goal was to create compelling, accessible content that appealed to China scholars as well as laypeople. “Radio, when done well, is very intimate and powerful. Podcasts are how many young people today consume information, and I predict we’re going to see more of them proliferating throughout universities,” he says, noting that his first eight episodes have drawn positive feedback, including social media mentions by prominent journalists like The New Yorker’s Evan Osnos and The New York Times’ Ed Wong and Ian Johnson. In one iTunes review, a foreign policy professor from another institution shared that the podcast was so worthwhile, he’d been assigning it to his students. Mahboubi and his guests have tackled a range of issues, from China’s 19th Party Congress to its Asian Infrastructure Investment Bank to its relations with India and North Korea. A recent episode featured Guobin Yang, Grace Lee Boggs Professor of Communication and Sociology, who expanded on the topics covered in his book The Power of the Internet in China: Citizen Activism Online. Yang appreciated the chance to introduce his research on Chinese social media platforms and their political implications to a wider audience. Interested in hearing more podcast episodes? To access the complete archive, visit the Center for the Study of Contemporary China’s main podcast page.